The pernicious insistence women’s interest publications place on the idea of being a “stress-free host” is ruining exactly what makes home entertaining over the holidays (and beyond) appealing. From September through January, hot takes pushing ways to mitigate holiday-hosting anxiety from “experts” and editorial staffs alike flood the internet, creeping into the subconscious of ever-worrying would-be hosts, whether they actually read the article or simply see the headlines on Facebook. One quick search for “stress-free party” yields page after page of guides, lists, checklists, and tips that assure our soirees will be stress-free. Whether these stories are contrived by lazy editorial staffs or there’s actually a genuine need for them on the part of the public is unclear to me, but the overall effect is the same: The most important metric of a successful party is that it be stress free. It’s a decent idea. The holidays are terribly stressful. There’s a ton of expectation to have a good time, to recapture the magic of your childhood, to subscribe to the traditions of years past even though people grow and age and sources of joy evolve. Emotional baggage flourishes during this time of year, in addition to all the practical sources of pressure like spending money on gifts and prioritizing all the work holiday happy hours you’ll feel compelled to attend. It’s a lot! Of course you don’t want to add to more stress to the chaos. It makes sense that you might offer to host a party and then find yourself utterly overwhelmed. Maybe buying premade dishes from Trader Joe’s and setting your table three days before the party, as these “stress-free hosting” articles advocate, is exactly what you need to make the prospect of a party a little less taxing. Working through all the minutiae weeks beforehand will allow you to spend more time with your guests and loved ones, so the theory goes. But this is dumb. Most of these odious articles aren’t set up with anything more insightful than “Let’s face it, the holidays are stressful.” They provide no evidence of how or why the holidays are stressful or that eradicating said stress in the face of a party is, indeed, desirable. There’s an assumption that readers want and need to be less stressed and that stress is, without exception, bad. But here’s the thing: stress, even just a bit of it, ensures you’ll throw a party where people actually have fun. And the whole point of hosting a party is showing your guests a fun time. Let’s say in your attempt to be less stressed you buy all your food premade. This leads you to spend less time in the kitchen, thereby eliminating a viable hangout location. There’s almost always a guest who wants to get away from the fray by taking a break in the kitchen where it’s a little quieter. With no host cooking, a guest seeking a moment of solace might be perceived as antisocial, rather than as a good friend who wants to help chop vegetables or assemble a cheeseboard. Different folks react to crowds differently, and providing as many emotional outlets as possible through contrasting microenvironments is one way to ensure all your friends have a nice time. Stress, even just a bit of it, ensures you’ll throw a party where people actually have fun. From a different perspective, if you easily feel weary when overstimulated (as I do), cooking also allows you, the host, to be on the periphery of the conversation. You can introduce friends and chime in when you feel like it without the burden of carrying entire conversations because you have to tend to whatever’s happening in the kitchen. To me, cooking, rather than buying premade food, is the less stressful option. It also automatically opens you up to questions and explanations about what you’re cooking. “I bought this at Whole Foods” is not a particularly compelling conversation starter. Here are some other examples of ways the internet says a host can be stress-free: make a game plan weeks ahead, serve a pre-mixed cocktail, set the table in advance, make a playlist, delegate. Some of this is actually good advice. It’s not a bad idea to plan your menu ahead of time, but that’s just basic party planning, a pillar of being a good host. Stress and being a good host are not mutually exclusive. A busy and excited host whose stress is palpable without being oppressive actually creates a fun energy. A lively home that’s warm and inviting with beautiful smells and crashing pots and pans assures people’s voices will rise, their stories will become bolder, and cups refilled more frequently. And, there’s fun to be found in successfully executing objectively challenging and stressful situations, like fitting 25 people in a studio apartment, or planning a last-minute menu for eight two hours before everyone arrives, or trying a recipe you’ve never even tasted. In contrast, a “stress-free” host, who buys all their food premade, meticulously ticks every item off a list, polishes their flatware two weeks in advance, and only makes one kind of cocktail in a pitcher conjures an image of a perfectly coiffed 1950s housewife in a waist-cinching dress with impeccable lipstick, casually carving a flawless browned roast while her husband sits at the head of the table. This ideal doesn’t exactly exude an air of effortlessness. This kind of host is excessively orderly and their desire for perfection is itself actually anxiety-inducing, which is the last thing a stress-free host should want for their guests. And what guests think is ultimately the whole reason why you’re hosting in the first place. Hosting is, in some part, an appeal to our own vanity. We want guests to compliment our recipes and tell us how cool our dogs are and that our homes are nice. We want friends to wake up the next morning and think about how great the party was. We want them to be excited the next time they get an invitation from us, knowing that they’re going to have an experience they wouldn’t have elsewhere. We want to revel in the sense of accomplishment we feel from this grown-up performance. We should strive to take care of our guests, to make sure they feel that they are special and that we’re not cutting corners in order to soothe our own unease. 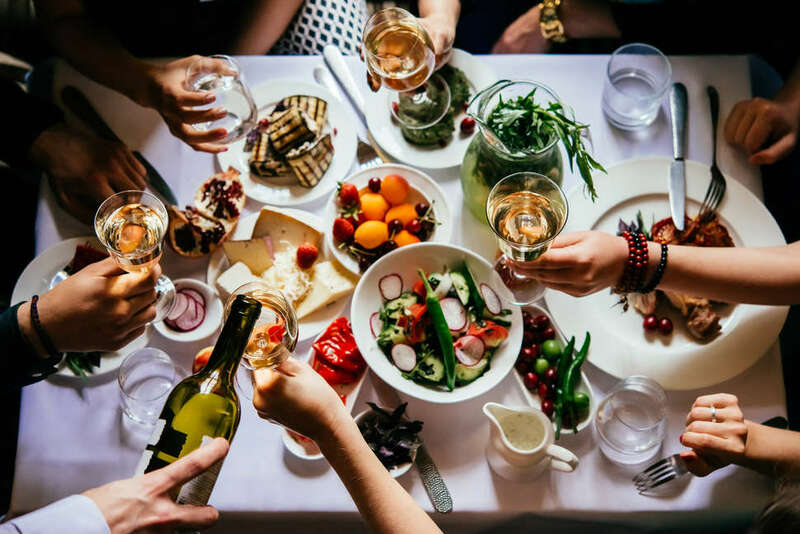 The better goal of hosting this holiday season, and all other times of the year, is to not try to be less stressed, but to try to be the best host you can be, however is right for you and the people you invite. Stress is a pretty universally maligned state-of-being presently, but it isn't useful to dwell on something wholly inescapable. A little healthy anxiety is not so hard to govern -- and it makes parties much more worthwhile. Carrie Dennis is a Brooklyn-based editor and content strategist who recently hosted a 30+ person party and NO ONE cried.